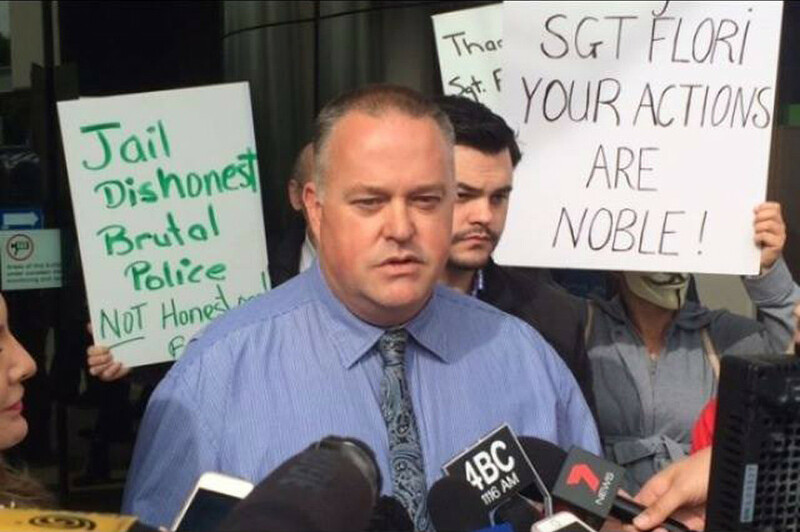 Queensland, AU (RT) — Gold Coast police officer Sergeant Rick Flori may spend up to seven years behind bars for leaking CCTV footage showing his fellow officers brutalizing a young chef, Noa Begic, while he was handcuffed in the Surfers Paradise Police Station basement. Flori, who leaked the footage of the dramatic incident to the Brisbane Courier-Mail, was formally charged with misconduct in public office after being summoned to police headquarters in Brisbane last week, the newspaper reported. The footage taken in 2012 shows police officers slamming Begic’s face into the concrete floor before the 21-year-old is shoved into the back of a van and brutally punched a number of times by one cop while another holds him. The video then shows Begic’s blood being routinely washed away by a senior-sergeant who would later quit the force before any adverse findings were made by internal investigators. The senior-constable who threw the punches was only given a suspended dismissal, according to the Courier-Mail. The other two officers involved were reportedly not disciplined at all. According to Sydney Criminal Lawyers, police allege that Flori, who had spent a quarter of a century in the Queensland Police Force until he was suspended earlier this year, committed the offence by ‘inappropriately obtain[ing]’ confidential surveillance footage from the police CCTV room. Section 91A of the Queensland Criminal Code 1899 makes it an offence for a public officer, including a police officer, to release information gained as a result of their office. The prosecution must now prove that the act was done with the intention of dishonestly gaining a benefit for Flori or another person, or dishonestly causing a detriment to another person, Sydney Criminal Lawyers report. The victim of the bashing, Begic, was arrested and charged with ‘public nuisance’ and ‘obstructing police’. The charges against him were later dropped and he won a confidential settlement from the Queensland Police Service, the newspaper reported. After his charges were dropped in June 2012, Begic said it would be “a disgrace” if the officer who leaked the video was punished. A complaint has been made by Council of Civil Liberties (a voluntary organization concerned with the protection of individual rights and civil liberties) to the Crime and Corruption Commission (CCC) which, according to Sydney Criminal Lawyers, is the same body that made the decision not to prosecute the officers involved in the bashing. “How is it that the police who were shown on the video as belting the crap out of this particular person have not been charged and yet the person who has leaked it is now being charged with an offence which could put him in jail?” Deputy President Terry O’Gorman told the team of lawyers. The acting chair of the CCC said she had asked staff involved in the incident to compile details about the matter. “I accept that needs to be looked at and we agree that police excessive use of force is one of the top five problems with police and we will be looking at that,” she told ABC radio. Last month supporters of Flori gathered outside the Southport Magistrates Court to praise the officer and show outrage over the four involved in the incident.